If you have boys, chances are you've got Hot Wheels. Hot Wheels and boys just go together, don't they? My brother played with them when he was little (and so did I), and my own two boys played with them when they were cute little things. Anyway, doing this project made me think of how fun this would be for little boys. It might be fun for bigger boys to do this with some of their old cars, too. As you probably can already tell, it's a super easy project. What You'll need: Hot Wheels or other type of car, heavy duty magnets, and a hot glue gun. I used a mini hot glue gun sort of like the one pictured above. 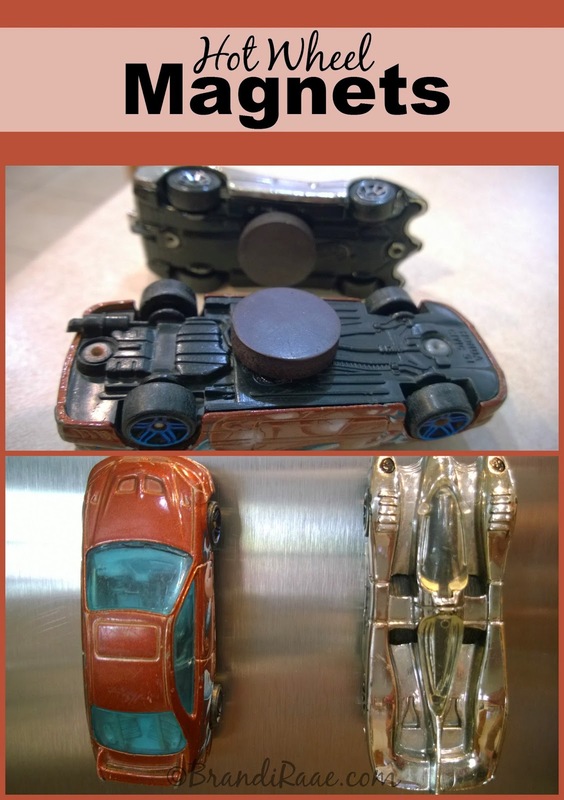 What You'll Do: Turn Hot Wheels upside down and hot glue the magnets of your choice onto the bottoms of the cars. In a few seconds, they're ready to hang on the fridge! Warning: Probably not a good project to do if you're afraid that your little ones might swallow the magnets. I can't imagine that being a pleasant experience.